Rear Admiral Grace Murray Hopper (9 December 1906 – 1 January 1992) was a U.S. Naval officer, and an early computer programmer. 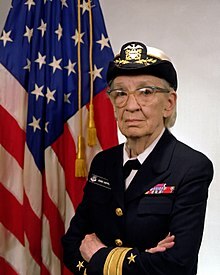 She was the developer of the first compiler for a computer programming language; at the end of her service she was the oldest serving officer in the United States Navy. We must state relationships, not procedures. Please cut off a nanosecond and send it over to me. We must include in any language with which we hope to describe complex data-processing situations the capability for describing data. We must also include a mechanism for determining the priorities to be applied to the data. These priorities are not fixed and are indicated in many cases by the data. Thus we must have a language and a structure that will take care of the data descriptions and priorities, as well as the operations we wish to perform. If we think seriously about these problems, we find that we cannot work with procedures alone, since they are sequential. We need to define the problem instead of the procedures. The Language Structures Group of the Codasyl Committee has been studying the structure of languages that can be used to describe data-processing problems. The Group started out by trying to design a language for stating procedures, but soon discovered that what was really required was a description of the data and a statement of the relationships between the data sets. The Group has since begun writing an algebra of processes, the background for a theory of data processing. Clearly, we must break away from the sequential and not limit the computers. We must state definitions and provide for priorities and descriptions of data. We must state relationships, not procedures. On the removal of a 2-inch-long moth from the Harvard Mark II experimental computer at Harvard in 1947, as quoted in Time (16 April 1984). Note that the term "bug" was in use by people in several technical disciplines long before that; Thomas Edison used the term, and it was common AT&T parlance in the 1920s to refer to bugs in the wires. Hopper is credited with popularizing the term's use in the computing field. At present, we're putting on paper a lot of stuff that never needed to be on paper. We do need to keep the records. But there isn't any reason for printing them. The next generation growing up with the computers will change that. Variant: If it's a good idea, go ahead and do it. It is much easier to apologize than it is to get permission. Variant: That brings me to the most important piece of advice that I can give to all of you: if you've got a good idea, and it's a contribution, I want you to go ahead and DO IT. It is much easier to apologize than it is to get permission. Actually attested since mid-19th century. There's something you learn in your first boot-camp, or training camp: If they put you down somewhere with nothing to do, go to sleep — you don't know when you'll get any more. [The Computer] was the first machine man built that assisted the power of his brain instead of the strength of his arm. As spoken at Space Coast 1987  speaking about the Harvard Mark I computer. The Computer was originally She in reference to the Mark I. Attributed to Hopper, without source, in The UNIX-HATERS Handbook (1994), edited by Simson Garfinkel, Daniel Weise, and Steven Strassmann ISBN 1-56884-203-1, p. 9, this is most commonly attributed to Andrew Tanenbaum, as it appears in his book Computer Networks (1981), p. 168, but has also been attributed to Patricia Seybold and Ken Olsen. But Grace, then anyone will be able to write programs! Widely reported quote regarding the development of COBOL circa 1954, but as yet unsourced. Admiral Hopper, … is the first woman to receive America's highest technology award as an individual. The award recognizes her as a computer pioneer, who spent a half century helping keep America on the leading edge of high technology.